What? My daughter isn't invited to the party because she can't have sugar? There are a lot of misconceptions when it comes to diabetes. 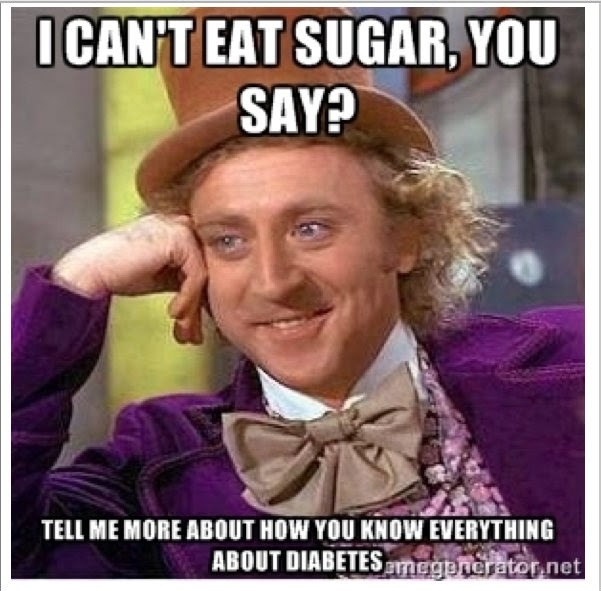 One of the most common is that diabetics are not permitted to have sugar. While diabetics do need to closely monitor their sugar intake and be aware of what foods cause a rise in blood sugar, they do not have to forego sugar altogether. My daughter was recently excluded from a birthday party for having diabetes. At least that's my assumption. I can think of no other logical reason since most of her other female classmates were included. While I don't expect everyone who comes in contact with my daughter to know or understand the ins and outs of dealing with this complex medical condition, I do expect everyone to have some compassion. We try very hard as a family to keep life as normal as we possibly can for Harper. Whenever possible we allow her the same freedoms that any other child has. She goes to playdates, participates in sports, enjoys ice cream on a hot day, eats cupcakes and other treats when celebrating a friend's birthday. The only difference is that she does it all with the help of insulin injections. Children with type 1 diabetes are painfully aware of how different they are from their peers. The constant monitoring of their blood sugar and the trips to the nurses office throughout the day for carb counting and insulin injections make it difficult to forget that you are not like the others. So, when my husband and daughter and I strive to create normalcy for Harper and in a matter of moments another parent rips that normalcy away and reminds my child that she is indeed not in the majority, I take offense to that kind of treatment. It's unnecessary, and it's irresponsible. A child with a medical condition whether it's an allergy, diabetes, or some other handicap, should be treated just as any other child. Invite everyone to the party, and allow the parents to make the final call on whether the child will attend. If you are in doubt, contact the parents. I can tell you that a phone call from a concerned or inquiring parent is a touching gesture. It shows me that you care enough about my child to reach out to me. It's the responsible thing to do. It's the kind thing to do.